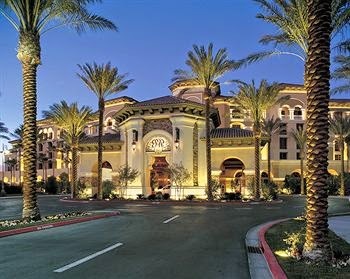 Perched high on the southern slopes of the Las Vegas Valley, eight miles southeast of the Strip in suburban Henderson, the $300 million Green Valley Ranch became the tenth in the ever-expanding Stations chain when it opened at Christmas 2001. While owner Frank Fertitta III described it as being his latest attempt to "create the perfect mouse trap," he's not trying to catch mice so much as big cheeses - high-spending, luxury-loving gamblers who don't want to stay on the Strip. Whether such creatures actually exist is debatable, but with its extensive pools, spa, and panoramic gardens, Green alley Ranch is certainly a well-laid trap. Local residents come for the usual good-value Stations buffet, the movie theater, and outlets of such restaurants as Il Fornaio and Border Grill.